Beijing, (Xinhua), 2014-08-11 – More than 150 economic fugitives from China, most of whom are corrupt officials or face allegations of corruption, remain at large in the United States, according to an official from the Ministry of Public Security. “The US has become the top destination for Chinese fugitives fleeing the law,” said Liao Jinrong, director general of the International Cooperation Bureau under the Ministry of Public Security. Figures from the ministry show that during the past decade, Chinese police have brought only two fugitives home to stand trial. One of those was the high-profile fugitive Yu Zhendong, former head of the Bank of China branch in Kaiping, Guangdong province. Yu was found guilty of corruption and embezzlement of funds of up to $482 million, and was repatriated in 2005 after spending four years on the run. 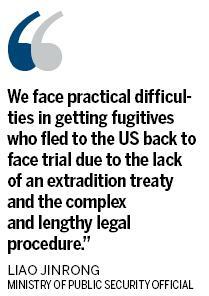 “We face practical difficulties in getting fugitives who fled to the US back to face trial due to the lack of an extradition treaty and the complex and lengthy legal procedures, ” Liao said. He said an extradition treaty is essential between the countries but little progress has been made with the US. Moreover, experts said, US judicial authorities misunderstand the Chinese judicial system and procedures. “They always think Chinese judicial organs violate suspects’ human rights,” said Wang Gang, a senior official from the America and Oceanic affairs division of the ministry’s International Cooperation Bureau. Wang said that, lacking an extradition treaty, there is only an annual meeting in August or September between China and US judicial authorities to discuss major concerns, including cross-border drugs, weapons trafficking and cybercrime. The Ministry of Public Security is attempting to set up an annual high-level meeting with US judicial authorities, including the US Department of Homeland Security, in a bid to apprehend more Chinese fugitives, Wang said. If this is established, participants will discuss major issues and exchange views on intelligence, case assistance, criminals’ repatriation and the recovery of transferred assets, he said. If that is achieved, it will represent great progress, Liao said. The ministry said Chinese police initiated a campaign in July to capture economic fugitives who have fled overseas. The ministry has set up special action teams and assigned local public security bureaus to collect evidence, conduct case-by-case studies and draw up plans to arrest suspects, said Liu Jinguo, vice-minister of the Ministry of Public Security. They will also strengthen law enforcement cooperation, including intelligence sharing, case investigations and recovering transferred funds from other countries, and conduct joint operations with those countries, he said. Additionally, members of the general public who provide information will be rewarded, Liu said.